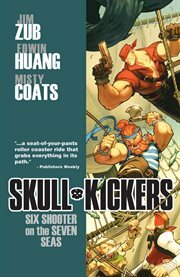 The instance Skullkickers, Volume 3, issue 12-17, Six shooter on the seven seas, writer: Jim Zub ; pencils: Edwin Huang ; inks: Edwin Huang ; colors: Misty Coats. "Tavern tales" writer: Jim Demonakos ; "Tavern Tales" artist: Joe Ng, (ebook) represents a material embodiment of a distinct intellectual or artistic creation found in Charlotte Mecklenburg Library. This resource is a combination of several types including: Instance, Electronic.